dimas-gallery: Help with translation - Faith, Hope and Love! subject: Help with translation - Faith, Hope and Love! My friend went to Turkey and got himself a tattoo in chinese or japanese. According to him it says "Faith, hope and love", but being the sceptical person I am, I thought I should send a picture to you to verify. 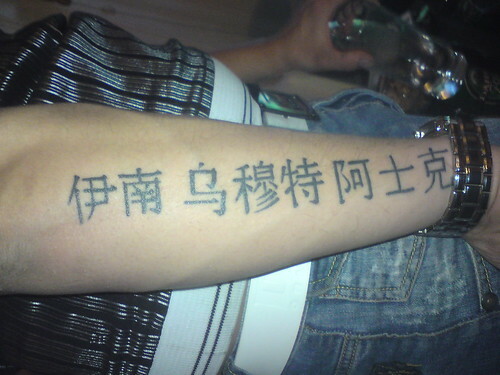 To one that is only familiar with Chinese or Japanese, this tattoo would be gibberish. A quick look via Google Translator, I soon realized this is Chinese phonetic translation of Turkish, where Faith is "inanc" (伊南), Hope is "umut" (乌穆特), and Love is "ask" (阿士克). The irony is with current situation in Xinjiang, China, were most ethnic Turks reside, Chinese and Turks are not on the best of terms. Why would anyone stupid enough to get a Turkish phrase to be phonetically translated & tattooed in Chinese? It's like begging to be the Lucky Pierre in middle of an ethnic conflict.